Weekly Market Analysis: February 8th to 12th 2016 - Find the best Binary Options Brokers, Binary Options Bonuses, Binary Options Signals, Binary Options Software and everything Binary Options related on Binary Options Directory! 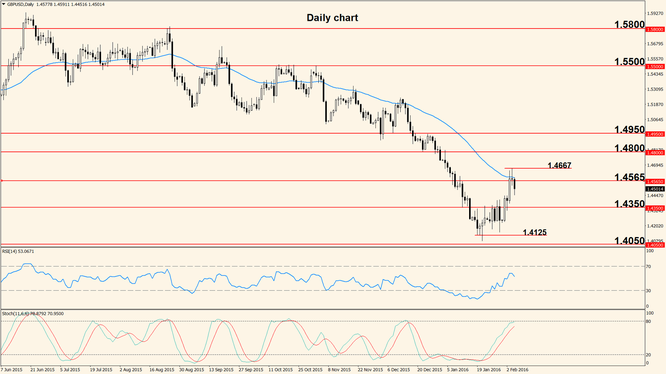 Weekly Analysis: Last week the pair finally broke out of the range it was stuck in and moved more than 400 pips to the upside, setting the stage for further bullish price action. The strong move up was stopped by the resistance zone near 1.1210 and now the pair shows signs of rejection. It’s possible to see a descent into 1.1040 – 1.0980 zone but the main bias is bullish and price is likely to head towards 1.1450 in the near future. The Daily Relative Strength Index has reached overbought and is now curving downwards, suggesting that a retracement lower is next. The first 2 days of the week are slow in terms of economic releases, with nothing major scheduled, but action picks up Wednesday when Fed Chair Janet Yellen will testify before the House Financial Services Committee on the Semiannual Monetary Policy Report. The following day, Thursday, she will testify again on the same topic but this time before the Senate Banking Committee. Both days she will answer unscripted questions asked by the members of the Committees and volatility is likely to increase, depending on her attitude. Also Thursday, the Eurogroup Meetings take place and this is another reason for strong movement. Friday will be possibly the busiest day of the week as the German Preliminary CPI (main gauge of inflation) comes out, as well as the U.S. Retail Sales and the University of Michigan Consumer Sentiment Survey. Sales made at retail levels represent a major part of the entire consumer spending which in turn accounts for a hefty part of overall economic activity and the Consumer Sentiment survey is indicative of future levels of consumer spending so the two indicators are tightly related and usually higher numbers strengthen the US Dollar. 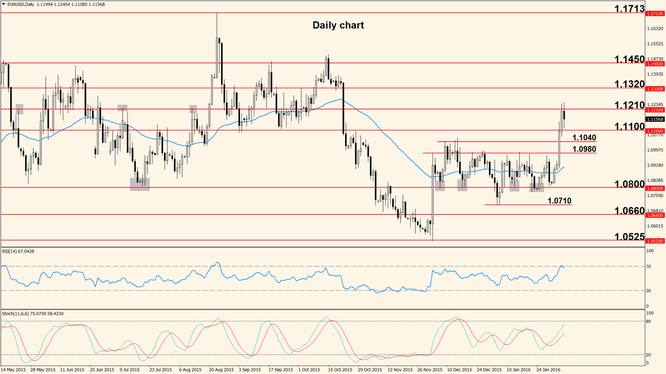 The US Dollar lost ground against the Pound as well, generating a huge climb of more than 420 pips and a much needed retracement for the overextended downtrend. Price has touched the 50 period Exponential Moving Average twice last week, bouncing lower and showing that the bullish pullback may be over. If the Moving Average and the resistance zone around 1.4565 manage to repel the bulls’ assault, we will probably see a move into 1.4350 this week, otherwise the pair will probably continue towards 1.4800. First minor hurdle that needs to be overcome is last week’s high, located at 1.4667. The only notable releases scheduled by the United Kingdom for this week are the Manufacturing Production and the NIESR Gross Domestic Product Estimate. The first indicator shows changes in the total value of output generated by the manufacturing sector and the GDP is an economy’s main gauge of overall performance. Both are scheduled for release Wednesday and higher numbers may bring Pound strength.